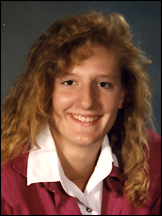 Brenda (Meyer) Corrow, Class of 1992, played volleyball, basketball, and track for PAHS and then played basketball for St. Cloud State. At PAHS, Corrow earned nine varsity letters: four in basketball, three in volleyball, and two in track. Moved up to varsity midway through her ninth grade season, Corrow scored 978 points in her four-year varsity career, fifth-most on the all-time list. When she graduated, she held the girls' single-season school records for most rebounds, most offensive rebounds, most defensive rebounds, and most blocks. Her three rebounding records still stand, though her blocked shot record (90) has since been broken. She earned All Conference honors in basketball during her junior and senior seasons and was also named team MVP. During her senior season, the Dogs beat state-rated Albany, advanced to the subsection final (where they lost to New London-Spicer, which finished second in Class A), and finished with a record of 17-7. In track, Corrow advanced to state her senior year in the high jump and earned All State honors by placing ninth at state. She had placed third in conference that year (just missing All Conference honors) and third at sections (though she qualified for state by meeting the state standard). In volleyball, she earned honorable mention as a junior and All Conference and team MVP as a senior. At SCSU, the six-foot center scored over 1,000 points for the Huskies and led the North Central Conference in rebounding and scoring both her junior and senior seasons. She was named All Conference both her junior and senior years and was named conference MVP her senior season. She was the first SCSU female player to earn conference MVP honors in basketball. She finished her career ranked second in NCC history in rebounding (620), fourth in free throws attempted (352), sixth in scoring (980), seventh in free throws made (243), ninth in field goals made (356), and tenth in blocked shots (78). Corrow and her husband Todd (currently serving in Iraq) have two sons. They live in Cleveland, Minn., where she works as a team coordinator for Heartland Home Care and Hospice and where she coached varsity girls' basketball for four years. The pep talks that Coach Skoglund gave us before the games...always had a point to them that we could use throughout life. After coaching myself for many years, I always wondered how he could turn any subject into a pep talk. Singing the school song after winning games (as loud as we could)!!! And "57-second sprints." Anybody who played for Skoogs knows what those are like...and how much he made us run them! How did high school athletics prepare you for life? Time management is the big one. Learning to balance school, extracurricular activities, along with family and friends at the same time. Teamwork...working together to get things done. Even though something may not go your way, there's always another game or opportunity tomorrow. Why do you consider yourself lucky to have graduated from PHS? It gave me a good background in teamwork, leadership, and education. It taught me to always appreciate and respect the values of a small community and the people within it.